@jpastor - Give me my 2nd mystery box, please. @pjbear2005 Sorry bro, @KrampisZman's Glyph of Protection protects him from Bombs. . . unfortunately you did not pick a valid target in time, so the bomb explodes in your face, destroying your Delve into Madness entry. - A Mystery Challenge: Create a Vivid land. - Favorites: Pick one of your sets. I will go through that set and favorite all cards I like in it. - A Mystery Challenge: Create a card that has a custom ability from the mechanix encyclopedia. - A Mystery Challenge: Create a Surrakar creature card. Can I get another please? 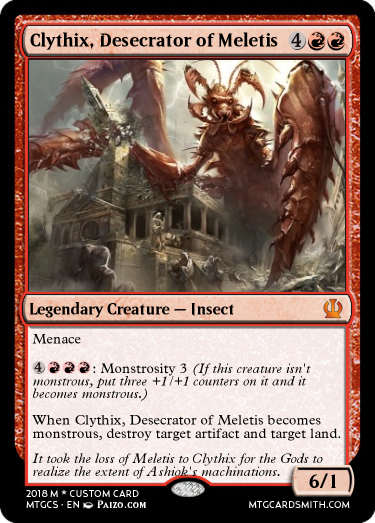 ***A little flavor context*** Clythix is not native to Theros. He was scavenged from interplanar dreams by Ashiok and through his power, brought into reality in Theros. @jpastor Thanks. I'm still getting the hang of this forum. Could you open one of them? Do I select a number? - A Mystery Challenge: Create a new Eldrazi + Subtype creature card. In Eldritch Moon, the emerge creatures were funky Eldrazi types. Create a new one. - A Mystery Challenge: Create a black card that allows you to look at an opponent's hand, choose a card from it, and make them discard that card. This should not be the only thing the card does. - A Mystery Challenge: Create a red Aura card. - Favorites: One favorite of my choice. - A Mystery Challenge: Create a legendary creature card themed after a movie character. I would like a box. - An Extra Entry: You can submit two cards for this mystery box's challenge. - A Mystery Challenge: Create a Wall creature card with CMC 1 or less. And I'll pass on the other card, thanks. Another box if possible. Any entries from this point on are considered entries for the next deadline.